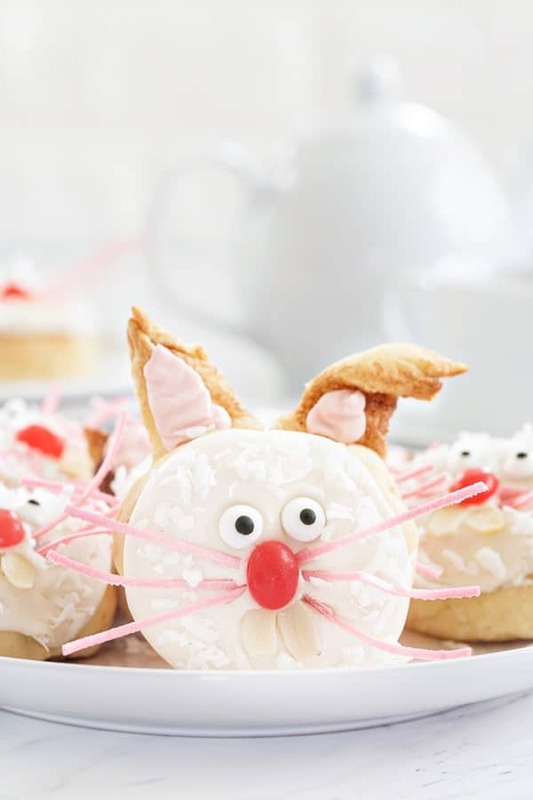 Easter Bunny Cinnamon Rolls are the cutest way to start your Easter brunch. We even added coconut “fur” at my baby girl’s insistence! This is a sponsored post on behalf of Fleischmann’s® Yeast. 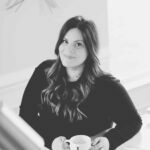 Thank you so much for continuing to support the brands that make My Baking Addiction possible. Do you go all out for Easter at your house? We definitely do. It’s kind of our first big family event of every year. We start with brunch, and kinda go all day. There’s delectable honey roasted ham, and buffet-style dishes of everything from roasted carrots and mashed potatoes to quiche. There’s also a huuuuuuge Easter egg hunt for Elle. I’ll be the first to admit – given she’s the only grandchild, we all go kinda nuts. Now that she’s old enough to help, she and I spend hours dying eggs in the most fun colors. My dad helps Eric hide them all first thing in the morning, and then we all help Elle find them. There’s lots of chocolate and Peeps, but we do try to actually get everyone around the table for some real food too. 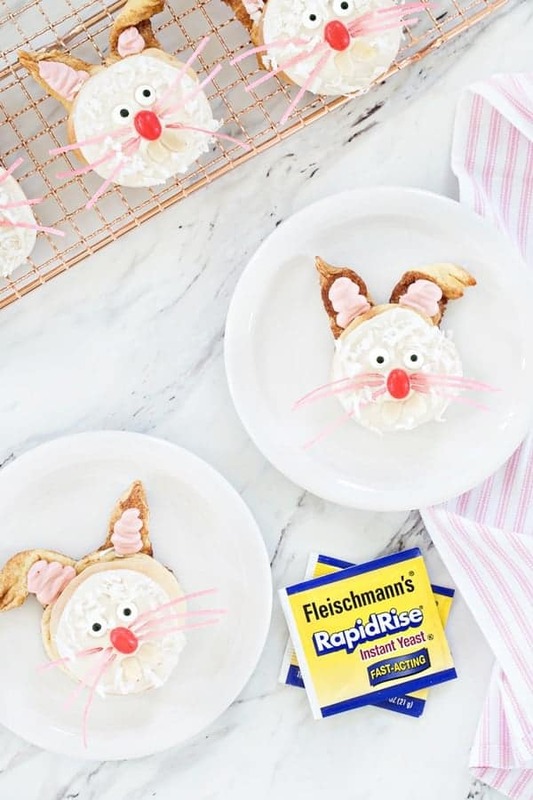 This year, in addition to dying eggs, Elle and I are making these adorable Easter Bunny Cinnamon Rolls. They’re traditional cinnamon rolls, made extra special by forming them into sweet little bunny faces. You can use licorice strings for the whiskers, or do what we did and use edible Easter grass. They make for a sweet and festive way to start your Easter day, that much is for sure. 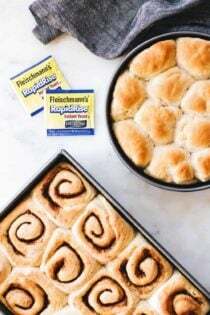 Making your own cinnamon rolls is actually quite easy, especially when you use Fleischmann’s® Rapid Rise Yeast in your dough. It makes the rise you need for supple cinnamon rolls a complete snap. No guesswork here. 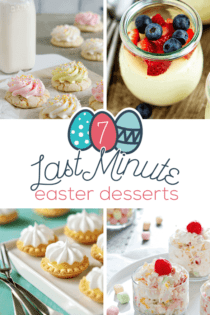 You can make the dough ahead of time and keep it shaped and refrigerated, ready for baking off as your family rolls in the door Easter morning. You can even decorate them together! 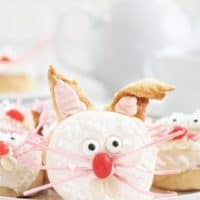 Just keep the icing ready and in the fridge, and assemble your candies for decorating – cute candy eyes, edible Easter grass or licorice for whiskers, jelly bean noses, and slivered almonds for bunny teeth. 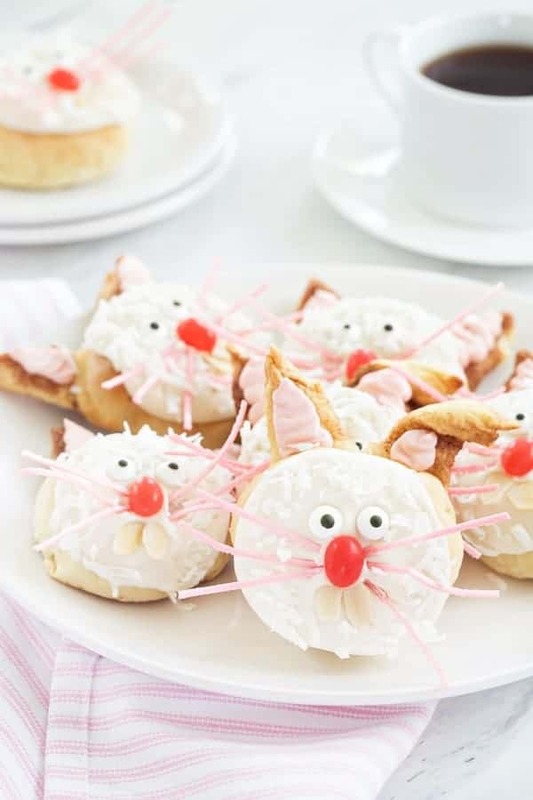 This recipe makes 16 delectable Easter Bunny Cinnamon Rolls, making it perfect for a crowd, too, but you might want to bake a little extra because these adorable bunnies are sure to a huge hit! 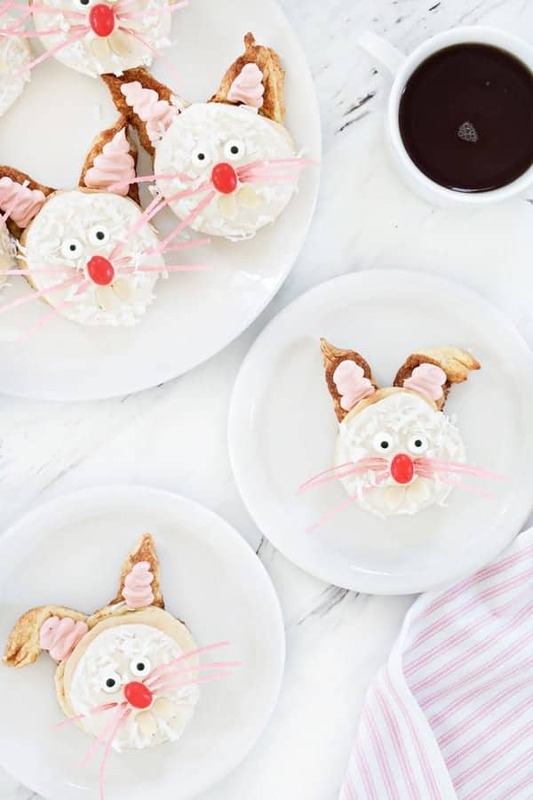 Add these bunnies to your Easter table – I just know your family will love them! 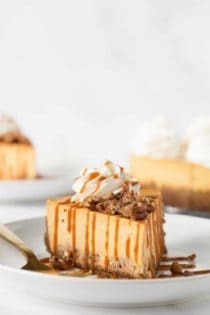 If you’re looking for more delicious Easter brunch recipes, be sure to check out these Toffee Cinnamon Rolls and these Mini Chocolate Pecan Cheesecakes. 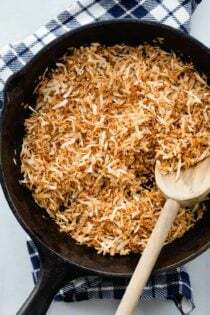 Combine 2 cups flour, sugar, dry yeast and salt in a large mixer bowl and stir until blended. Place water and butter in a microwave-safe bowl. Microwave on HIGH in 15 second increments until very warm but not hot to the touch (120° to 130°F. Butter won’t melt completely). Add to flour mixture with egg. Beat 2 minutes at medium speed of electric mixer, scraping bowl occasionally. Add 1 cup flour; beat 2 minutes at high speed, scraping bowl as needed. Stir in just enough remaining flour so that the dough will form into a ball. Knead on lightly floured surface until smooth and elastic, and dough springs back when lightly pressed with 2 fingers, about 6 to 8 minutes. Cover with a towel; let rest for 10 minutes. Divide dough in half. Roll 1 half into a 12 x 10-inch rectangle on a lightly floured surface using a rolling pin. 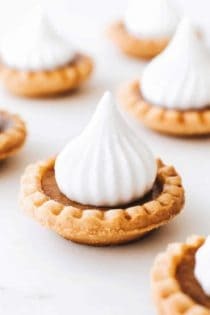 Spread 1-1/2 tablespoons butter over dough leaving a 1-inch border on the long edges. Sprinkle with half of the cinnamon sugar mixture. Beginning at long end of rectangle, roll up tightly. Pinch seams to seal. Cut into 12 equal slices. Place 8 rolls, cut sides down, on greased baking sheet. Leave plenty of room around each roll. Gently unroll remaining 4 rolls, resulting in 4 long strips. Cut each into 4 equal pieces. Position 2 strips as "ears" for each roll, tucking an edge under roll. Turn down top edge to make a "floppy ear." Repeat with second half of dough. Cover with towel; let rise in warm place until doubled in size, about 30 minutes. 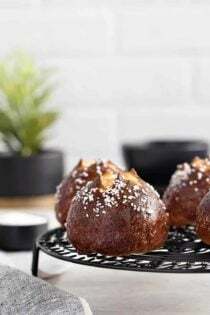 Bake in preheated 350ºF oven for 15 to 20 minutes or until rolls are golden brown. Cool on pan for 5 minutes, then carefully remove to wire rack to cool an additional 15 minutes. 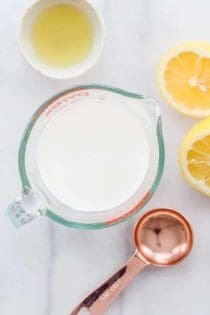 Combine all frosting ingredients (start with 3 tablespoons milk and add more if needed) in a large bowl and beat until creamy. 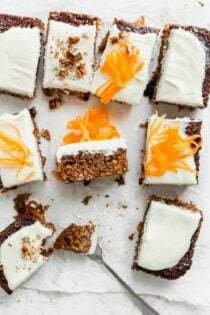 Remove 1/4 cup icing and place in a small bowl; set aside. Spread remaining icing over rolls. Add a drop of red food coloring to reserved icing to create a light pink color. Frost pink icing over the ears. 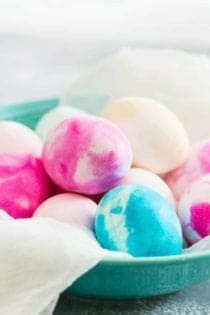 Decorate faces with small candies for eyes and nose, add licorice whiskers and use sliced almonds for teeth. 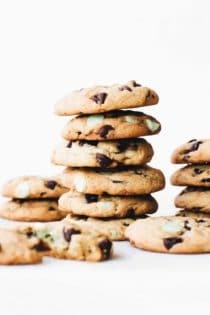 Make ahead tip: Refrigerate dough after forming bunnies, allow an extra 30 minutes after removing from the refrigerator before baking. I hope they enjoy them, Susan! 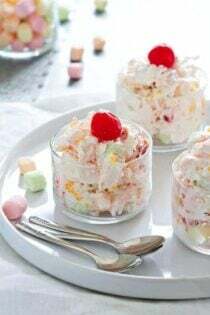 Oh these look so cute and yummy! 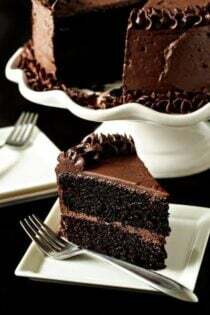 I wish I had one right now. ~giggle~ Oh, I hardly ever use yeast (scary) but you’ve made it sound easy enough that I should give it another try. Thanks for sharing with us! You’re welcome, Roseanne! Please let me know if you give it a try! Thanks so much for this recipe. It looks delicious and the final product is just too cute. 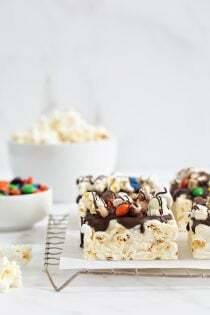 I will definitely be making this on Easter and I know my family will LOVE them. 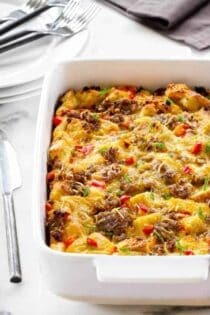 I know I can count on your blog for awesome recipes. Thanks again for all the great recipes. Thank you so much, Sienna! I hope you have a great Easter holiday. So so cute, Jamie!!! So perfect for Easter!